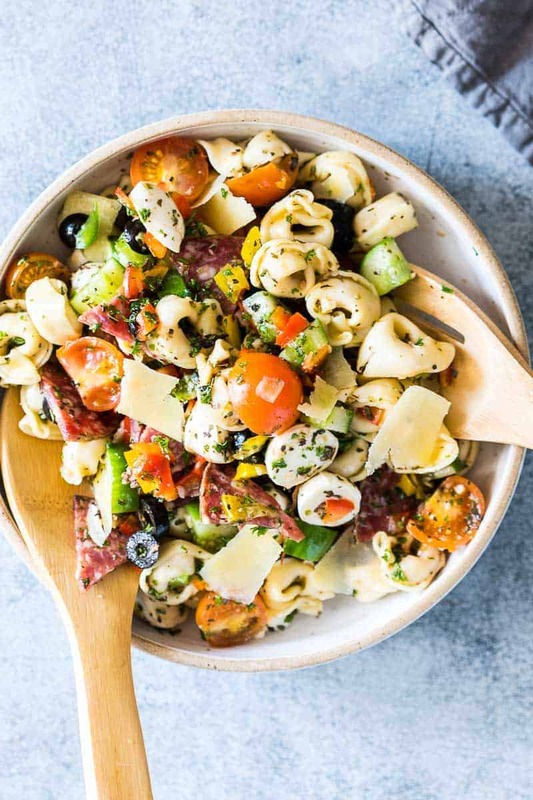 Italian Antipasto Tortellini Pasta Salad is an easy, cold, make ahead salad which takes under 20 minutes to make and is perfect for picnics, barbecues and family dinners! Before we get into this italian antipasto tortellini pasta salad (which is absolutely delicious), I have news to share. My sisters getting married next week! Yes, my little sister who is all grown up now. And I’m back home prepping for her wedding which is in less than six days now. So while I’m sitting here at 9 in the morning writing this post, I have to tell you that life is a little crazy right now. There is a two day wedding, everyone in the house is running around trying to finish all the last minute stuff, and these mornings before the craziness start are precious. Usually, the four of us – my parents, my sister and I, take a moment to sit together and enjoy a cup of tea, in the mornings, but today I knew I needed to share this pasta salad with you guys! All the recipes that you see in the next week are things that I’m not eating (currently), but have been eating and loving in the last one month. And so I made a repository of recipes that I knew I wanted you guys to try. 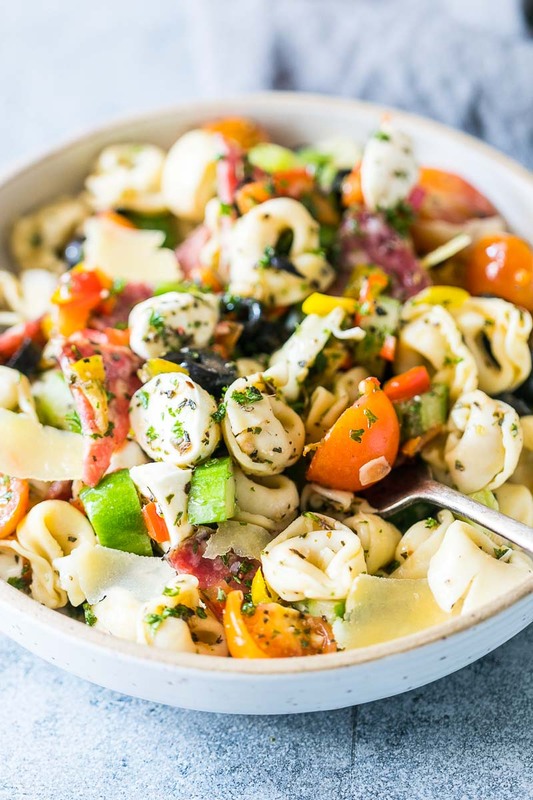 And this italian antipasto tortellini pasta salad is definitely one of them! I’m cheating a little bit with this salad. Because really, it was mostly a way to do something with leftovers an antipasto platter I put together for a few friends one evening. We had some salami, tomatoes, cucumbers, peppers, olives, cheeses and loads of other delicious tidbits in the platter. Obviously I served gigantic proportions, and obviously we couldn’t finish everything. Why do I end up making so much food when we have guests over? But this time instead of bagging it up for friends, we ended up using the leftovers to put together this amazing italian antipasto tortellini pasta salad for next days dinner. This is the quickest pasta salad you are going to put together, and literally the easiest! But you have to be patient, because we found out that this italian pasta salad needs to marinate. It does well with a little lovin’ and waiting in the refrigerator. So once you put everything together and toss it up with the dressing – yes, unlike other salads where you add the dressing just before eating – this pasta salad can be made ahead and should be made ahead. So you toss it all up and refrigerate. It just gets better and better after a few hours. And you can’t skip this step. Because without the waiting, the salad doesn’t get time to soak up that yummy dressing. BTW, don’t take the easy route and use store bought dressing because that dressing takes only a minute to make, and will give your pasta salad a major flavour and freshness boost. Take this to your next barbecue, picnic or make this for a kiddie lunch box – it’s always going to be a hit! Cook the pasta in salted water according to package instructions till al dente. Drain, wash with cold water (to prevent sticking) and set aside. Add all the ingredients for the dressing to a jar or blender and blend for a minute or two. Toss all the ingredients for the salad with the dressing and refrigerate for at least 3-4 hours. The pasta stays well in the refrigerator for up to 2 days. Is it really a tablespoon of salt or is that a typo? in italy anyone has never eaten a salad like this. 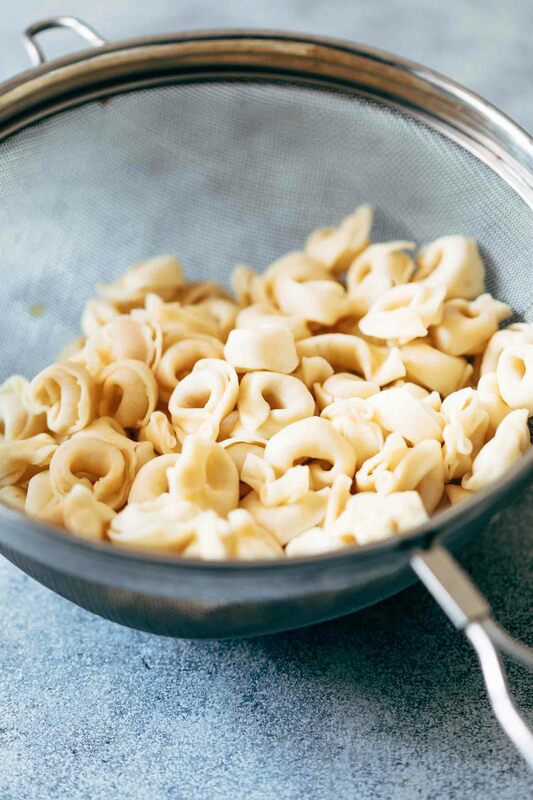 tortellini are fresh pasta, to cook with broth or with sauce, hot, not cold. I don’t claim that its authentically Italian. But I love the flavours of this salad and I hope you’ll try it sometime. Just stumbled upon this recipe after a google suggestion! Looks amazing. Clarification: in the pic it looks like you used zucchini not cucumber. Is there a mistake in the ingredients list or are those really cucumbers? Ty!!! SO perfect for a picnic. This looks delicious. Wow, looks one amazing salad. Will skip the salami and try this with rest of the ingredients. Lovely, appetizing pictures too.